Vendor Description: Mango Green Tea Decaf, is a sweet blend of decaffeinated green tea from the Korakundah estate in Nilgiri, India combined with mango piences and calendula. With an intoxicating aroma, this fruity and flavorful green tea provides the perfect introduction to those new to green tea, or simply looking for a delicious, caffeine-free green tea blend. Leaf: This leaf has a brown-green hue to it. There are yellow blossoms mixed in amongst the twisted green leaf. There are small dried pieces of fruit in the mix. The leaf appears drier than a green tea from China or Japan. The shape of the leaf somewhat reminds me of a Darjeeling. 1st Infusion: This infusion had a brownish caramel hue to it. Considering this was a green tea this was rather surprising. There is a light sweet aroma that quickly fades away. The flavor of the tea is very sharp. There is not much mango in the flavor of this tea at all. Most of the flavor from the tea is up front, but it is very short lived. It quickly dies off leaving not much on the back end. There is no astringency to the back. 2nd Infusion: The flavor was very similar to the first infusion. Not much flavor overall, and very short lived. Conclusion: I don't drink many green teas from outside of Japan and China, let alone decaf. This tea was somewhat of a reminder of why. Normally I don't drink many decaf teas either. The flavor was light in comparison with the tea flavor, and I acknowledge that flavoring a green tea is a difficult proposition, but it still could have been better. Vendor Description: Coco Chai rooibos tea is a handcrafted, caffeine-free chai tea made from South African rooibos blended with shredded coconut, red peppercorns and aromatic spices including ginger, cinnamon and cardomon. This twist on a classic chai tea will surprise with its intoxicatingly aroma and spicey but sweet flavor. Leaf: This is a rooibos based chai blend. It has a mix of coconut, peppercorns and cardomon. There was also some ginger in the mix that I saw. There is a very sweet and distinctive coconut aroma to this tea. It has a much bolder aroma than most chai. 1st Infusion: The tea had a golden brown / light reddish hue to it. Again the distinctive coconut aroma was easy to pick out. The flavor was sweet and flavorful, it felt like just the right amount of rooibos flavor in comparison to the flavor of the spices. There was no bitterness or astringency to it. The flavor was just at a right level for making htis without using a milk/sugar mix for this chai. Conclusion: This tea is a good value. The suggested mix was to use less tea than I would normally have used for a test, and it turned out to be a good amount. The price by itself is quite good for a 4 oz bag. The flavor was well balanced. That said it lacked having a little bit of distinguishing characteristics from other chai aside from being rooibos based. A more prominent coconut flavor might be interesting. Vendor Description: Snow Orchid is the most popular Dan Cong tea due to its strong peach aroma and taste. The strong oxidation and roasting allow the special character of this tea to remain stable for at least two years. Appreciate the dry leaves that smell like the local orchids blooming in winter from which this tea is named. After brewing, the clean honey tea color will yield a robust flavor that fill the mouth and leaves a complex lingering aftertaste. The Chaozhou people, from whom this tea comes, are famous for their rich diet and frequently pair this tea with meals to improve digestion. Leaf: The leaf for this tea had smallish leaf for a Dan Cong. It is still large in size. The leaves are black with brown highlights and grey on the edges. 1st Infusion: This infusion has a light brown color. It is almost red in hue. The aroma is interesting, it has a certain woodiness to it. The flavor is light with a pronounced sharpness on the back end. I found that the aroma was quite captivating with a very nice smoothness up front. There was a very light astringency on the back end. The flavor is lighter than most Dan Cong. 2nd Infusion: This infusion has a stronger core Dan Cong aroma to it, the aroma was much sweeter this time. The color was a red-brown hue. The flavor is much richer and quite full bodied. It was lightly sweet, but much more flavorful. There is a medium sense of astringency. It gives me a peaceful feeling. 3rd Infusion: This infusion had a lighter red-brown hue to it. The flavor was even richer than the second infusion. It was smooth and a bit more subdued. There was a medium sense of astringency. It leaves a bit of a rough feeling on my tongue. 4th Infusion: This infusion had a light brown hue with a very light aroma. The tea is still smooth and flavorful with a medium sense of astringency. Conclusion: This was a very flavorful DC. This was very enjoyable and is rather inexpensively priced. The flavor got richer for the second and third infusions for three very pleasant infusions. I can't think of any significant downsides to this tea. Thank you to Jessica over at Authoritea for this sample. Vendor Description: To most Westerners, it is a little known fact that the word 'Chai' simply means 'tea' in Hindi. Therefore, all teas are technically chais. However, instead of the 'chai' that most Americans are used to (which usually contains really bad tea), we offer an Oriental Spice tea - premium Ceylon black tea with a unique blend of spices; cinnamon, cardamom, and ginger. Leaf: The leaf for this tea looks like a normal orthodox black tea leaf. There are small pieces of ginger and orange peel mixed in. There are also small chocolate colored brown pieces in there which I couldn't really identify. Based on the description of the tea I would assume the pieces to have been the cinnamon. The aroma of the tea is very chai like. 1st Infusion: This tea had an aroma sweeter than most masala chai that I have tried. It seems very close to a traditional masala chai though, and based on the ingredient list it is very similar to most chais. The tea itself has a dark red almost chocolate brown hue to it. It has a very chai like flavor on the back end of the flavor. It is very rich with a light sense of an astringency on the backend. Conclusion: This tea is very much like a traditional chai, but has a higher tea:other ratio than most chai. It is quite inexpensive though, but the rest of the Adagio selection of chai are all relatively equally priced. If you want a chai like tea, I would suggest getting one of the specified chais. Adagio Teas is partnering with the Nature Conservancy to plat a tree for every order placed on April 22nd. Lupicia has a few new offerings, including a limited set of the Hawaii blends and their annual sakura selections. The first of the shincha has already started arriving in the US. Shincha season is starting up! Temomi Shincha from Sugimoto is on it's way! Vendor Description: Organic Lu An Gua Pian green tea, also known as "Little Melon Seed" is an exquisite, high-grade green tea grown in China's Anhui province. Processed using only the beautiful emerald green leaves, without any buds, the Lu An Gu Pian tea dates back to the Tang Dynasty. This refreshing green tea yields a sweet and floral taste with a smooth filong lasting finish similar to that of a Ti Kuan Yin oolong tea. Leaf: The leaf has light green edges and is lightly twisted. It's not rolled as finely as a sencha, but not open like a Phoenix oolong. The edges of the leaves are light green, but the center of the leaf is dark green. 1st Infusion: The tea has a light yellow green hue to it. The aroma is nicely sweet. The tea is very sweet, especially for a green tea. It is rich and flavorful without much bitterness or astringency. It is pleasant, but a bit average in flavor, there is not much that really stands out in the flavor. 2nd Infusion: This infusion was a lightly murky infusion with a yellow-green hue. It is abit more yellow than green. The aroma isn't very prominent anymore, there isn't much of an aroma to it at all. The flavor is a bit sharper. It is sweet at the onset, and then turns a stronger and that's where the sharpness is. Conclusion: This tea was quite enjoyable, but a bit on the mundane side. The first infusion was nicely sweet and subtle. The second infusion showed a bit more character, but nothing outstanding. Factoring in the price I would probably pick something a bit more interesting, but there was nothing wrong with this tea. Vendor Description: Our Organic Earl Green tea, an organic Darjeeling green tea blended with bergamot, is a unique twist on the classic Earl Grey black tea. One of our employee favorites, Organic Earl Green makes a great breakfast tea or can be enjoyed all day long. This loose tea is ideal for friends who are new to green tea. Also refreshing on ice. Leaf: Considering this is a green tea, you could have fooled me. The leaf is dark, with shades of browns and black. I would have guessed it to be a mix between a Darjeeling and orthodox black. There is a little bit of silvery leaf mixed in as well. There is a very strong citrus aroma (which I believe is the bergamont aroma, but never having smelled true bergamont it's hard to say for sure) The aroma reminds me somewhat of lemon pledge. 1st Infusion: This tea has a medium citrus aroma to it. The tea has a green-brown hue. The flavor is very strong and intense, filled with a strong feeling of citrus. It's hard to find the portion of this tea which is really that green. There is a sharp bitterness to it and a medium sense of astringency on the back. Conclusion: I've never really understood the fascination with Bergamont flavored teas. Earl Grey is probably one of the most singularly famous teas. Right down to the Star Trek references for the stuff. This tea has a strong flavor to it, so if you enjoy bergamont you will probably enjoy this tea. It feels more like a black tea than a green, but it must be brewed as a green. It is lighter than an earl grey so that part is a bit more enjoyable. 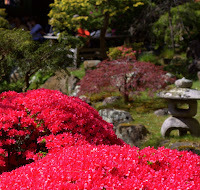 So a few weeks ago I had the opportunity while in San Francisco to visit the Japanese Tea Garden. 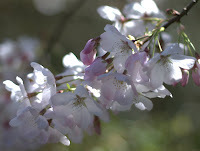 This was the first time that I had been there in a while and this was right during cherry blossom season. While this doesn't really have to deal directly with tea, it is very relative. The tea garden is quite an experience, and does in fact serve tea. The tea served is either Sencha, Genmaicha, Oolong (yes, that's as specific as it is), or Jasmine. I believe they refered to the Sencha as just Green. For 4 dollars you get a pot of tea and a small bowl of cookies and rice crackers. While the tea itself is nothing special, the location is everything in this case. Sipping on a cup of tea while watching sakura petals fall and with some of the plants in just radiant bloom is an experience unto itself. This was also an opprotunity for me to play around with my new camera lens. If you're ever in SF and have some time to relax, it's definitely worth going to the tea garden. It makes you remember that it's not all about the tea itself, but rather the experience. Vendor Description: Blend of tea grown under cover to block sunlight from Yame, Fukuoka Pref. It has slightly less astringency and stronger sweetness, a characteristic of Yame tea. Leaf: The leaf for this tea is a dark green chumushi. There is a little bit of stem in the mix, but aside from that a very typical looking sencha. 1st Infusion: This tea has a rich sweet aroma. Instantly it reminds me of what makes Yame Gyokuro so special to me. The initial color of the tea is a bright green brilliance, which reminds me of the radiance of a shincha. It is lightly murky, nowhere near as much as a fukamushi though. Slightly after pouring the color changed into a yellow green hue. The flavor is rich and bold with a light astringency. It is a very strong and bold sencha flavor, similar to a fukamushi, but with the depth of an asamushi. There is a bold grassy/marine flavor to this tea, which again reminds me of a Yame Gyokuro. 2nd Infusion: This infusion was a murky green hue. There was a lot of sediment in this cup, it reminded me much more of a fukamushi this time around. The flavor was lighter and clearer with just a hint of bitterness. The bitterness was paired with al ight sense of astringency which left me with a nice clean feeling aftertaste. The flavor was rich and bold. Conclusion: By the description of this tea it sounds like it is a kabusecha. In retrospect to the taste I can see where this is noticeable, without having said that though I probably would not have noticed at all and just chalked this up as a very interesting sencha. It is unfortunately a bit on the pricey side, but it also is in a very rare class of tea. Yame Senchas are not very commonplace from what I have seen, only a small handful of vendors even offering one. It shares a lot of characteristics with it's much more famous Gyokuro brother and I found myself very much enjoying this tea. As I continue to try more Yame Senchas though I wonder how this one will compare to those. An enjoyable and unique experience though. Vendor Descripton: One of our proudest products, which is a blend of Houjicha with the rich sweet fragrance of apricot. Aroma of Houjicha and faint sweetness match unusually well and produce this delicious tea. Teabag: The teabag has aroma of dried apricots. It is a slightly sweet aroma. The leaf looks rather small and dustlike, smaller than the normal houjicha leaf used for most of the flavored houjicha from Lupicia. 1st Infusion: This tea exhibits a beautiful brown houjicha hue. The tea has a light aroma. It still reminds me of apricots. The flavor is smooth with no bitterness or astringency. There is a little bit of an apricot flavor on the front end. The middle and back end of the flavor is filled with a light houjicha flavoring. It is a very relaxing feeling houjicha. Conclusion: This tea shows promise, but as a teabag it feels rather light. The teabag could stand to use more leaf in it, but because of that I feel the need to try this out in loose leaf as well. The flavor hints that it could be great in a bit bolder form, but at a 5oz to one teabag ratio this is a bit light for my tastes. Thankfully the flavor carries in from the aroma unlike some flavored teas. Sugimoto USA currently has preorders open for their shincha for this year. Somewhat different than a lot of other vendors, Sugimoto's shincha is only going to be available for preorder only. I.e. the item will not be carried in stock after the preorders are fulfilled. Being introduced to the US for the first time this year is their Temomi-cha (now referred to as Temomi Shincha). This tea was absolutely amazing when I had the opportunity to try it out last year. It is unlike any other sencha that I have tried. It's only available for preorder for the next few days though. After April 15th, preorders are closed and you'll have missed the boat. I highly suggest you try some. Vendor Description: An ancient Hindu legend recounts the story of the mango tree growing from the ashes of the sun princess who had been incinerated by an evil sorceress. When the mango ripened and fell to the ground, the beautiful sun princess emerged. Our bestselling Mango Tea combines the taste of Ceylon tea with the flavor of perfectly ripened mangoes. Sun princess sold separately. Leaf: This is another one of the lineup from Adagio's flavored tea category. It has their typical black tea base to it, with some dried fruit and yellow blossoms mixed in. It has a rather unusual musky aroma to it. 1st Infusion: This tea produces a very typical black tea, red hue. The color is somewhat vibrant and warm. There is a very sweet fresh mango aroma paired with the smell of dried mangoes. The tea itself is somewhat light bodied for a black tea. The flavor itself feels sharp and there is a rich fruitiness on the back. There is a medium sense of astringency when it finishes off. Conclusion: There is nothing impressive about this tea. It falls right into the ranks of the rest of the flavored lineup from Adagio. Good if you want to make a mango inspired blend with one of their signature blends, but unless you're a great mango fan I don't see many people picking this one up specifically. Vendor Description: Popular oolong tea from Fujian Province, has a faint floral aroma and a greenish sweet flavor. The tea leaves are rounded small and firm. Leaf: This tea is rolled into little balls similar to a Taiwanese oolong, but not as tightly. They're still farily loose. There are some rather sizable pieces of stem in the mix as well. The balls have a mix of green and brown hues to them. 1st Infusion: This infusion has a clear yellow brownish hue to it. There is a very light yet uplifting floral aroma to this tea. The flavor is light and clear, to match well with the aroma. There is no aftertaste to speak of, just a simple clean flavor. 2nd Infusion: This infusion has a rich dark yellow hue to it. The aroma is still floral, but lighter than the first infusion. The flavor is still somewhat light, but it is bolder up front this time. There is no aftertaste, but the front has a feeling like a very well balanced tea. It is bodied, but does not have much flavor behind it. It is like you can feel the texture of the tea, but can't bring to mind much in terms of a central flavor to concentrate on. It's an almost creamy flavor, but it has a very warm mouth feeling to it. 3rd Infusion: This infusion has the same yellow-brown color as before. The aroma is even less noticeable this time around. Despite the decreased intensity it is still the same aroma. The tea has the same texture as before. There is a certain smoothness to it that is hard to describe. It finishes with a light astringency. Overall this infusion has a floral and pleasant oolong flavoring to it. 4th Infusion: This is again the same hue as the previous infusions. There is not much aroma to it this time around. The flavor is a little bit lighter. After sipping this tea there is a cooling feeling in my mouth. There is a medium sense of astringency on the backend, but not much else besides that. Conclusion: This wasn't a particularly mindblowing tea, in fact it feels quite mundane and average. It is however a very nicely priced oolong. It produced 4 rather solid infusions, which for it's price is quite good. I haven't had many oolongs which have a very similar flavor, so the flavor is somewhat unique. Vendor Description: Pouchong is one of the most famous of all Taiwan teas and ours is from one of the best producers. This deliciously smooth, very lightly oxidised green tea is almost an oolong. It has delicate floral notes with smooth, sweet undertones and a soft apricot finish. All the Pouchong produced at the Xu Family farm is bought up very quickly by local buyers. We are the only company outside Taiwan to have access to this exceptional tea. Leaf: The leaf for this tea is a very light and fluffy green leaf. The shape and size somewhat remind me of a Wuyi or Dan Cong Oolong. There is a very fresh aroma to it and the leaves have a very matte green color to them, spanning the spectrum of green colors. 1st Infusion: The tea has a clear green hue to it. The aroma reminds me of a Taiwanese green oolong. The flavor is very light and smooth. It has a very green and fresh feeling to it. Rather surprisingly it gives me a very wet feeling in my mouth. There is a strong central flavor with no bitternes or astringnecy. 2nd Infusion: Again this feels very much like most green oolongs. The color is a rich shade of green. The flavor is smooth with a barely noticeable sense of astringency. The flavor is very strong and intense. 3rd Infusion: The flavor is still rich and fresh. This infusion feels very much like the second infusion. It is very pleasant and enjoyable, with just a hint of being lighter than the second infusion. Conclusion: This is a very enjoyable tea, it has an outstanding flavor to it. The downside to this tea though is that there is nothting that feels that oustanding about it aside from it's very fresh and light taste that it has. As enjoyable as this taste is it does not account for the somewhat steep price for this tea. Leaf: The leaf for this tea is a very well formed Asamushi. The needles are long and thin with a minimal amount of dust. Some of the leaves are almost an inch long and there is very little stem in the mix as well. 1st Infusion: This tea produced a pale yellow green color. Considering that this is an asamushi there is a fairly green hue to it. There was a ligth nutty aroma to it. There was a rich umami flavor to this tea, it is almost like a gyokuro in texture. There is a typical light bitterness in the aftertaste. The flavor is very crisp and pleasant. There is not much of a shincha radiance to this tea though. 2nd Infusion: This infusion had a more intense green color. The aroma is very light and uplifiting. The flavor has light and fruity notes. This fruitiness is followed by a light bitterness. There are hints of the thickness from the first infusion, but nowhere near the same as the first infusion. There are also grassy notes in the aftertaste that compete with the sencha kick. Conclusion: This is a very enjoyable asamushi. This is one of the shincha offerings from Lupicia and I did not open until well past the initial few months when shincha is freshest. Even with a few months of aging under it's belt it still shows a very pleasant flavor and some very complex characteristics. I look forward to trying it again this year. Leaf: This tea is comprised of large black leaf. It looks quite typical for a Wuyi Oolong. The leaves are light and fluffy, twisted as is normal. There is also a very prominent and heavy wuyi aroma to it. 1st Infusion: This infusion has a light amber hue. There is a pleasant light roasty aroma to it. The flavor is light with a sweet aftertaste. The flavor seems to develop more as the cup progresses. The flavor is mostly in the early portion and finishes a light sense of astringency. 2nd Infusion: This infusion has a darker brownish hue than the first one. The aroma is rich and sweet. The flavor is light and crisp. It has a very clean feeling to it. The middle of the flavor pokes out some hints of a heavy flavor and leaves with a heavy aftertaste. The afteraste was heavy as if the tea were all around heavier. 3rd Infusion: This infusion has the same enjoyable wuyi aroma. The flavor is bold and rich, it is upfront and smooth. The tea really opened up for this infusion. Although it leaves a bit of an empty aftertaste on the back end. Conclusion: This tea is very subtle. The first two infusions are light and pleasant. It's almost as if it takes the first two infusioins to open up, but the subtle infusions are light and pleasant. The tea is well handled and very intact, which for a wuyi is impressive. Thank you to Jessica over at Authoritea for this sample. Vendor Description: Sweet aroma of juicy melons and aromatic Taiwanese oolong tea. Infusion Parameters: 15g, 1 L , Overnight steep in refrigerator. Infusion: This tea infused into a clear yellow color. It has a sweet aroma, it's like a light cantaloupe aroma. The flavor is somewhat unusual, it is very cool and light. The strength of the flavor on my tongue very much reminds me of a piece of cantaloupe. The tea feels crisp overall with an aftertaste that reminds me of melon rind. Conclusion: I liked this tea this way. It was cool and refreshing, but the price of the tea is a bit high considering the ratio used. It makes for a somewhat expensive cup of iced tea. It is however very cool and refreshing. I wonder what this would be like with an actual piece of cantaloupe. About This Tea: PG Tips is a very widely available teabag. It is well known as being an enjoyed black tea blend. It can be found at a wide variety of stores including most grocery stores. Pricing for these can vary quite drastically based on volume (more than most teas). 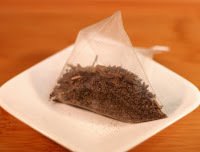 Teabag: The teabag is a paper pyramidal style teabag. There is no string attached to this teabag interestingly enough. Infusion: This tea has a bold black aroma to it. The tea has a copper red color. The beginning of the tea has a little bit of a bitterness to it, and finishes with a fruity aftertaste. There is a medium sense of astringency on the backside of the tea. Conclusion: This tea is surprisingly good. It is very inexpensive and quite available. There is nothing really to knock about this tea, but it just doesn't have any outstanding qualities to it. Fairly good tea though. Thanks to Jessica over at Authoritea for a few of these teabags. Vendor Description: Like the famed gyokuro, the tea known as kabuse-cha is shade grown--but for a shorter amount of time. This process creates a tea with the freshness of sencha and the richness of gyokuro. This particular tea comes from the famed Uji region outside of Kyoto. Enjoy its deep, mildly sweet flavor and vibrant green color. 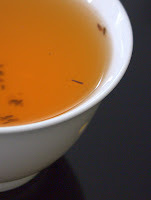 Leaf: The leaf for this tea has a very chumushi like appearance. There is a large amount of dust to this tea along with medium sized needles. It is not so small to be a fukamushi, it also doesn't move with in a very fluid motion. The leaf is very dark green and has a lightly grassy aroma. 1st Infusion: This tea has a rather thick aroma to it, it reminds me of a gyokuro slightly. The flavor is somewhat what I would expect of a kabuse, there are hints of gyokuro flavor to it. It exhibits gyokuro style grassiness, but the front of the tea is light like a sencha. The hue is a brilliant yellow color and it has a thick gyokuro aftertaste. It feels like it is more of a sencha than a gyokuro. 2nd Infusion: This infusion is a little bit cloudier than the first infusion. The tea is slightly greener in color, and it is almost aromaless. There are small hints of gyokuro aroma to it though. The taste is lighter and clearer than the first infusion. It feels like a very lighthearted gyokuro with the flavor of a gyokuro, but the lightness of a sencha. There is a just noticeable bitterness to it and it leaves a very light and clean feeling. It finishes with a light sense of astringency. Conclusion: This tea is very interesting as it straddles the traits of a gyokuro and a sencha rather well. Adjusting parameters I could see it as being very easy to produce one flavor more than another. It was enjoyable and tasty, but it's price is a bit prohibitive.